THIS SAT. & SUN. (IN OCTOBER) OUR CHURCH HAS “GENERAL CONFERENCE,” WHERE IN OUR HOMES (ON CABLE, IN SOME AREAS) OR IN CHURCH BUILDINGS THERE IS AN OPPORTUNITY TO HEAR A LIVING PROPHET SPEAK. (I OFTEN POST QUOTES FROM OUR LIVING & DEAD PROPHETS.) IT’S FILMED IN UTAH. 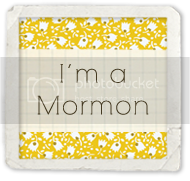 BUT IN OUR AREA, STARTING OCT. 1ST, MY CHURCH WILL CURRENTLY BE DOING THE “I’M A MORMON” CAMPAIGN, SO PEOPLE CAN DISPEL MYTHS & MISCONCEPTIONS ABOUT US THE CHURCH OF JESUS CHRIST OF LATTER-DAY SAINTS), & LEARN ABOUT OUR CHURCH & OUR BELIEF IN CHRIST. I’M SO EXCITED THAT I CAN DO THE “I’M A MORMON” CAMPAIGN. I’M PROBABLY MORE EXCITED THAN THE AVERAGE PERSON ABOUT THIS CAMPAIGN, BECAUSE IT REQUIRES NO TALKING, & I CAN DO IT! AS IS, I DO WHAT I CAN: I’M NOT ASHAMED 2 SHARE MY BELIEFS ON MY BLOG! THEY ARE A BIG PART OF ME! HOPEFULLY, ON OCT. 1ST MY PROFILE WILL APPEAR IN A SEARCH ON MORMON.ORG (IT’S DONE, BUT DOESN’T SHOW UP YET), I ENCOURAGE U 2 VISIT MORMON.ORG, & READ MY PROFILE. MK WILL ALSO BE ON THERE. SOON, I’LL ADD A LINK 2 MOROMON.ORG/MY PROFILE ON MY BLOG.